Toilet means something related to grooming or getting dressed. 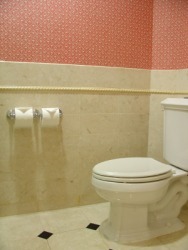 An example of toilet are travel-sized soaps and shampoos; toilet items. The definition of a toilet is a seat with a hole or hole in the ground where a person urinates or has a bowel movement, or a room where this seat or hole in the ground is located. An example of a toilet is a restroom. "toilet." YourDictionary, n.d. Web. 16 April 2019. <https://www.yourdictionary.com/TOILET>. The cleansing of a body area as part of a surgical or medical procedure. French toilette piece of cloth for wrapping up a bundle of clothes, items used for personal grooming, toilette, dressing table, toilet (by euphemism) from Old French tellette piece of cloth for wrapping up a bundle of clothes diminutive of teile cloth ; see toil 2. Now specifically, a room or enclosed cubicle containing a lavatory, e.g., a bathroom or water closet (w.c.). EPA is currently developing the specification for high-efficiency toilets. All HETs that meet WaterSense criteria for efficiency and performance will be eligible to receive a label once EPA finalizes the specification. "” US Environmental Protection Agency. Other similar devices, such as squat toilets, as in Japan or the Middle East. Before the 20th century, toilet universally referred to personal grooming, bathing and washing combing or arranging one's hair, shaving, etc., a sense preserved today in toiletry 'personal grooming item'. Nowadays, it is mostly used to indicate a lavatory. "Toilet of the mouth", however, is still in use by oral surgeons. From French toilette (“small cloth,") diminutive of toile (“cloth"); a cloth used to protect garments when making up the hair or shaving. An apparatus for defecation and urination, usually consisting of a bowl fitted with a hinged seat and connected to a waste pipe and a flushing apparatus. A room or booth containing such an apparatus.